Product Testimonials with photos for the Odd'Ball Jigs. If you have a Bait Rigs product testimonial that you would like displayed here, please to go to our Contact Page we will review it for posting. If we post your story we will give you a $10 product credit. Smallmouth can go deep and when they do there is no better presentation then working an Odd'ball Jig. We found Great Lakes Smallmouth in 20 to 30 feet of water, on the bottom and our best presentation was working Odd'ball Jigs tipped with scented Crawfish. Rock and rubble transition areas held the most fish and a drag and snap jigging technique was deadly. What sets the Odd'ball Jig apart, is it's counter balanced stand-up head, that produces a teeter tooter rocking action that simulates natural crawfish movement. Weedless rigging the Odd'ball preserves the hook point in the rocks while reducing snags when working the bottom. Our three day outing produced numerous fish over 5 lbs and several fish over 6lbs, two of which shown in the photo, were caught back-to-back. This is a monster fish pattern that I would recommend anytime Smallmouth go deep. The Rock River is not a river that is known for producing HUGE flathead catfish. It's not uncommon to see 20 pounders caught in the upper river, but nothing, I mean nothing of this magnitude!!! My 10 year old son and I were fishing walleyes on the Rock this last Friday near Ft. Atkinson WI just above Lake Koshkonong. At about 5:00pm one of our rods got hit so hard it darn near knocked the rod out of the Rod Holder!!! When I grabbed the rod I didn't realize the size of the fish so I did what I always do and handed my 10 year old son the rod, 15 minutes later we hadn't seen the fish yet because he was still fighting it!! Here I am standing there with the net giving him crap because he couldn't get the fish to the boat. Him being 10 years old I figured it was maybe a 15 lb Buffalo or Carp or something of that nature. He eventually got the fish alongside of the boat but couldn't get it off the bottom, he was tuckered out and handed me the rod for a few seconds. I immediately knew the fish was HUGE when I took the rod, I kind of felt bad for heckling him about not being able to get the fish >off the bottom!! LoL!! Once I saw the fish I realized the net was going to be no use so I handed the rod back to my son and he fought the fish up close to the boat within reach of my hands. I grabbed the fish by its mouth and pulled it into the boat!! I couldn't believe my eyes!! I had caught a 50 incher in 2010, and it weighed in the low 60's I figured this one to be in the high 60's or even bigger??? I deliberated on what I was going to do for about an hour because I didn't want to release a "potential" state record that my 10 year old son just landed!!! Eventually we said "what the heck" and we released her to be caught again another day. No official weight taken was ever taken of this fish, only an official measurement of 54"!!! Brayden couldn't lift the fish or hold the fish up for more than a second or two so getting a good picture was very difficult. I did get one picture snapped of him while he was attempting to hold the fish up and a little better picture of the fish, with me holding it up. "I'm an Odd'ball Jig convert and want to thank you for this vastly improved jig design. I fish the Detroit River in deep fast water that makes hooking and holding fish very difficult. I have caught over 100 walleyes on the Odd'ball Jig and have lost only 2 fish off hook sets. Using Northland jigs, I was losing about half of all fish that I hooked. Thanks again for producing a great Jig." We got this 13.95 lbs Green Bay walleye Friday evening! (March 30th) We were using 1/4oz odd balls tipped with a shiner. Thanks Bait Rigs! "The Odd'ball is a BIG FISH jig. It has the hooking power and unique head design needed to hook and hold monster Walleyes. A few years back I tied the World Ice Walleye record using the Odd'ball Jig. I've been hooked ever since. I dead rig Shiners on the Odd'ball and use a one-two punch presentation. First vertical jigging over bottom, utilizing the teeter- tooter action, then dropping it to the bottom in a stand-up position. It's been a time tested big fish presentation for me." My favorite jig, by far, is Bait Rig's Odd'Ball JigTM. It is the only jig I will use in tournament competition while vertical jigging. Here's why: The Odd'Ball is a stand-up jig, which is what you want when "ticking" the bottom while vertical jigging. You want the colored head portion of the jig to always be below the hook while the jig is sitting on the bottom, so that any fish that is attracted to the color has to inhale the hook to get to the jig head. 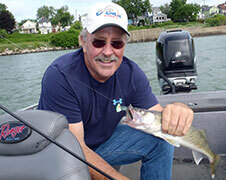 If the jig falls over and is laying flat on the bottom, a walleye will often pick it up by the head, causing the hook to be backward in its mouth or outside of the mouth resulting in a missed fished. ALWAYS use a stand-up jig when vertical jigging. Additionally, because the jig is a stand-up design, it doesn't get snagged on bottom as often, compared to traditional jigs. The Odd'ball jigTM also sits perfectly horizontal in the water when suspended at rest, which will allow the jig to quickly pivot, hook-first, into a walleye's mouth since the jig dressing or live bait is lighter than the jig head. This, again, is crucial to more hook-ups. Last, but not least, the counter-balanced head design exhibits a unique tetter-totter, strike triggering action when vertically jigged. My favorite colors are as follows: I use Chartreuse or Chartreuse/Green, Chartreuse/Orange most often. Hot orange or 14kt Gold are my favorite colors in stained, tanic acid or dirty water. The new generation Odd'Ball Jigs are now all Glow Colors. These jigs glow in color for over 3 hours. This jig has won me over $150,000 on the Professional Walleye Trail, including the Walleye Super Pro. I would have a tough time fishing tournaments or just for fun, without the Oddball Jig. Tony Puccio wins $3,000 for the biggest Walleye caught at the Baudette Minnesota PWT Tournament. The 33" monster Walleye was caught on a new 1/8 oz, Super Glow, Odd'Ball Jig tipped with a red tail chub. Tony was fishing transition areas from sand to rock in 12 feet of water. The fish hit while vertical jigging and then dropping the jig to bottom. Tony credits the Odd'Balls unique Teeter-Totter vertical jigging action and new Super Glow colors for triggering a strike from the Tournament winning Walleye. According to Tony the fish were off the bite and something extra was needed to trigger a strike. I am writing to you to tell you about what a great product you have. I have been using Oddball Jigs for several years now. I have found that they out fish many other product by a large margin. I have found that they are very easy to fish and even the novice angler is able to use this product and find it very productive. I have gone to strictly using Oddball Jigs and will not use any other jigs. 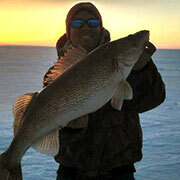 I have enclosed a picture of one of the many walleyes that I have caught using the Oddball Jig. This was a 28 inch walleye that was caught in June 2003. That same day I also caught a 27 inch on the same jig. 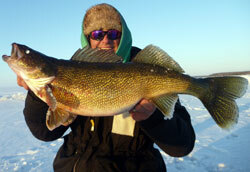 Ice Fishing Walleye Former World Record measured 33" long and weighed 13 pound 4 oz. Caught in Sturgeon Bay, WI. thru the ice using an Odd'Ball Jig and a dead rigged shiner. "The Odd'Ball Jig is my go to jig for Ice Walleyes. I like to use the Odd'ball with dead rigged Shiners. The large open throat hook gap is perfect for dead rigging and it produces positive hook sets on big fish. "The Odd'Ball Jig is unbeatable, especially in rivers when you drag the jig across the bottom. Its rolling action is a real walleye, bass and sauger catcher. My clients all like the Odd'ball after using them." 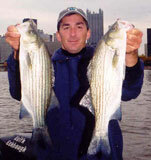 These wipers (White Bass & Striper hybrid) from the Ohio River in Pittsburgh were caught on Odd'ball Jigs with white paddle tails.